Telarc release “Park Avenue South”. Dave’s musical output continued unabated throughout the last two decades of his life. He signed with the Telarc label in 1993 and released 17 albums with them. They included two live albums from the Blue Note Jazz Club, "Late Night Brubeck: Live from the Blue Note" and "Nightshift: Live at the Blue Note"; also included were live albums such as the “40th Anniversary Tour Of The UK” and a recording from a Starbucks Café, “Park Avenue South”. He produced four solo albums with Telarc, including “Private Brubeck Remembers”. This album is a collection of uniquely crafted solo piano renditions of some of the most famous songs from World War II, many of which Dave played during his tour of duty with the Wolf Pack Band.“The titles of the tunes are almost an autobiography of my war years,” Dave said. “I think every person who has ever worn a military uniform can relate to my story.” The album included a bonus CD where Dave reminisces with Walter Cronkite about his WW II experiences. In May 2002, Dave entered the famous Abbey Road Recording studios with the London Symphony Orchestra and recorded some of his most important sacred compositions- “Pange Lingua Variations”, “Voice Of The Holy Spirit” and “Regret”. 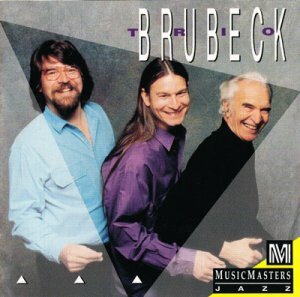 The resulting output was released on a double CD, “Classical Brubeck”. The vaults were opened as well; Columbia unearthed the last live performance by the Classic Quartet in Pittsburgh on 26 December 1967 and released it in 2011 under the title “Their Last Time Out”. The Monterey Jazz Festival label released “50 Years Of Dave Brubeck- Live At The Monterey Jazz Festival 1958-2007”. Dave continued to participate with other artists, and his recordings during this period included those with Yo-Yo Ma, Hilary Kole, Roberta Gambarini, Dr. Billy Taylor and finally his son Chris. “Live At Arthur Zankel Music Center - Triple Play” released in 2012 represents Dave’s last recorded output of a recording career that covered over 60 years from his first release on the Fantasy label. When British born Randy Jones first came to the United States, he received immediate critical recognition. He had previously played with the Maynard Ferguson Big Band, which was then based in England. In the US, he played with such jazz greats as Gerry Mulligan, Chet Baker and Milt Jackson. Dave invited him to join the Quartet in 1978, and there he remained right to the end. Randy has recorded with Dave on more than 30 albums and travelled on almost every world tour with him. He had the distinction of been the longest serving member of any of Dave’s groupings. Chris Brubeck continued with the Quartet both on tours and recordings. He recorded with Dave on all the Music Master label releases up to 1988 and was also present on four Telarc releases in the 1990’s, the last being “In Their Own Sweet Way” in 1997. He recorded with his brothers, Danny, Matthew and Darius, on the 2000 release, “Dave Brubeck: Live with the LSO”. 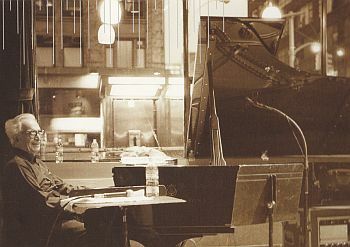 Darius, Danny and Matthew also recorded on the Telarc release “In Their Own Sweet Way”, while Danny joined Chris on the Telarc release “Trio Brubeck” in 1997. Dave first heard Bobby Militello with the Maynard Ferguson band at a jazz festival in Sugar Bush, Vermont. At a later jazz festival in Saratoga, New York, Bobby surprised Dave by stepping out of the sax section and performing a dazzling solo on flute. Dave made a mental note to remember that young musician. A few years later, when there was an opening for a horn player in the quartet, Dave tracked Bobby down through his old boss, Maynard Ferguson. He invited Bobby, along with other talented reed men in the New York area, to audition. Bobby arrived at the tryout already knowing most of the Quartet’s repertoire. He improvised with equal facility on alto and tenor sax and flute. 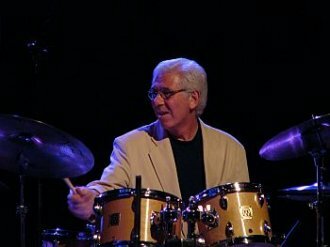 He remained an integral part of the Dave Brubeck Quartet performing with Dave since 1982 right until Dave’s retirement. He first recorded with Dave on the 1988 Music Master release “Quiet as the Moon". He played on all of the Quartet's Telarc releases. Bassist Michael Moore, an acknowledged master of his instrument, and former leader of his own duo and trio, joined the Quartet in 2000 following the retirement of Jack Six. Born in Cincinnati, Michael joined the Woody Herman Band at the age of 20, became an important player in the New York jazz scene and recorded with such luminaries as Bill Evans, Stan Getz, Chet Baker, Zoot Sims, Tony Bennett and Gil Evans. He remained with Dave until Dave decided to retire from touring. Jack Six, who joined Dave in 1968 shortly the after he disbanded the Classic Quartet, remained with him until 2000, when he decided he no longer wanted to actively tour. His last studio recording was the Telarc release “So What’s New?” and his last live recording was “Double Live From The U.S.A. & U.K.” – live recordings from tours in 1995 and 1998. 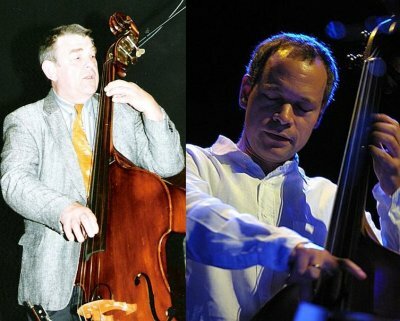 Other musicians who recorded and toured with Dave in this period included Alec Dankworth, a UK bassist who toured with Dave during the late 1990’s and early millennium; he also recorded four albums with the Dave Brubeck Quartet prior to Michael Moore joining. 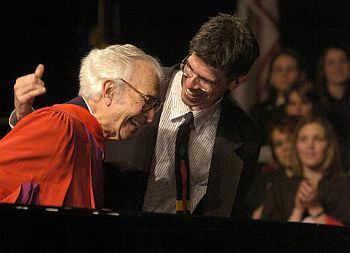 Since 1976 Russell Gloyd, conductor, was long associated with Dave Brubeck acting as his personal manager and friend. He conducted the many symphonic and choral appearances of the Dave Brubeck Quartet in the United States and around the world. In June of 2004 he was one of seven conductors participating in the 100th anniversary concert of the LSO, which was attended by Queen Elizabeth II. In 1995, he made his Vienna debut conducting the European premiere of the Brubeck Christmas cantata "La Fiesta de la Posada", and returned in 2000 for the Viennese premiere of the Brubeck mass "To Hope! A Celebration." 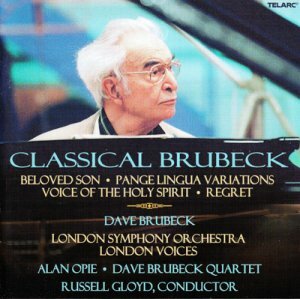 In April of 2003 he was back in Vienna conducting the European premiere of Dave Brubeck's Easter oratorio "Beloved Son". Russell acted as producer on numerous Dave Brubeck albums. In May of 2002 he was in London with the London Symphony at the famed Abbey Road Studios recording a 2- CD set for Telarc entitled "Classical Brubeck”. In January of 2004, Naxos Records released Davee's "The Gates Of Justice" conducted by Russell. In August 2007 Sony BMG Europe released the live recording “Brubeck Meets Bach” with Gloyd conducting the Bach Collegium of Munich. During the period outlined in this section, Dave was honoured to receive a large number of prestigious and very important awards that acknowledged his outstanding musical career and his continued use of his music to highlight his intolerance of prejudice and to advocate for civil rights and racial unity. The full list of awards Dave received throughout his career are outlined here. Below are just some of the more prestigious honors bestowed upon him. 1994 Honorary Degree, Duisburg University, Germany. 2000 Bocconi Medal from Italy. Only 4th artist to be honoured. A full and detailed section of the Kennedy award is in this section. 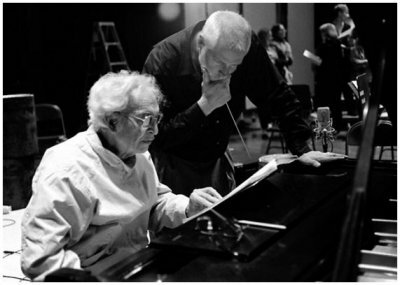 In collaboration with The University of The Pacific, Dave and Iola established The Brubeck Institute in 2000 and in so doing so created perhaps Dave’s greatest legacy outside of his vast musical recordings. Dave wrote the following piece in 2000. “When I graduated from college in 1942, little did I dream that some day an incredible program such as that offered by the Brubeck Institute would be established at my alma mater, University of the Pacific. Back in the '40s, the thought of a jazz studies program at the Conservatory of Music was inconceivable. We weren't even allowed to play jazz in the practice rooms. Although I was enrolled in the Conservatory as a music major, I was also engaged in an unauthorized course of study, playing jazz piano in nightclubs and dance halls, gaining real life experience as a musician and performer. This was my internship and initiation into the world of music making. Now, such performance opportunities are created in the Fellowship program that allows talented students to focus on practice and performance while learning from professional musicians and visiting jazz masters. The Institute is a realization of a dream. From the earliest days in my career, I sought the acceptance and recognition of jazz as a serious art form that reflected American ideals of freedom and individual expression balanced with group responsibility and interdependence. Like America itself, jazz has always drawn from many cultures and has been enriched by that cross-fertilization. The Brubeck Institute is not about jazz studies alone, however. It is also about social and philosophical issues. Over the years, I have become more and more interested in applying these thoughts to classical composition for chorus and orchestra, chamber ensembles, and contemporary music in a variety of forms. I believe in the power of music to transform lives as well as to enlighten and entertain. Once when asked how I would like to be remembered, I answered, "As someone who opened doors." 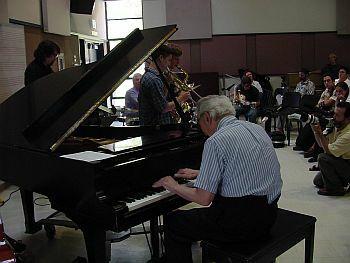 The purpose of the Brubeck Institute is to provide the key that opens doors for all who participate, whether as a research scholar in the Brubeck Archives, a Brubeck Fellow or Colonist, a member of academic symposia, a classical performer or teacher, contemporary composer, or an interested member of the audience. The door is open. 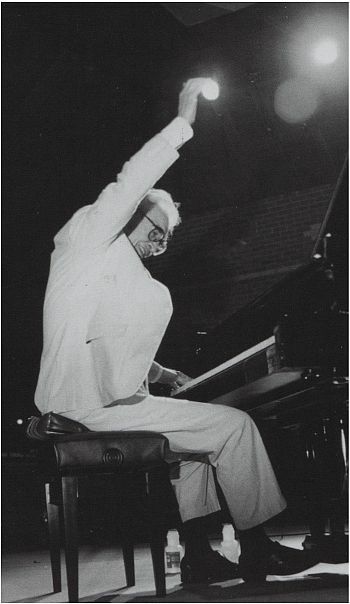 The mission of the Institute is to build on Dave Brubeck's legacy and his lifelong dedication to music, creativity, education, and the advancement of important social issues, including civil rights, environmental concerns, international relations, and social justice. It advances the multi-disciplinary study, performance and perpetuation of Dave Brubeck’s musical compositions, recordings, performances, career, times, influence and influences, with emphasis on, but not limited to, jazz. 1. The Brubeck Fellowship Program is a one- or three-year full-scholarship program in jazz performance for five musicians who have just graduated from high school. These are the Brubeck Fellows, and they comprise the Brubeck Institute Jazz Quintet (BIJQ). Since its inception there have been 37 Brubeck Fellowes many who are now on the path to sucessful full time careers in Jazz. 2. 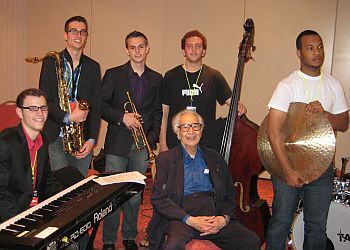 The Brubeck Outreach Program is designed to encourage the performance, study and understanding of jazz in its many forms; explore contemporary concert music; enlighten and broaden the general knowledge and appreciation of music; and promote the understanding of the work and influence of Dave Brubeck. 3. 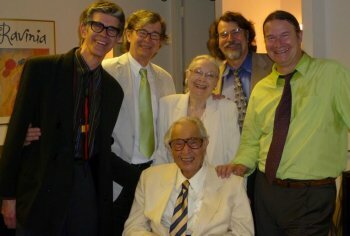 The Brubeck Collection is one of the world's largest and most comprehensive collections from a contemporary musician; it consists of Dave and Iola Brubeck's correspondence, legal and business documents, musical recordings, music manuscripts, photographs, printed programs, memorabilia, and other important archival material. 4. 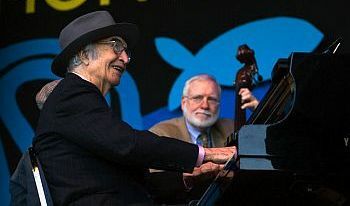 The Brubeck Festival is an annual event that celebrates and explores the musical, intellectual, and philosophical ideas of Dave Brubeck, as well as his influence on the world of music and ideas. 5. The Summer Jazz Colony is a one-week, full-scholarship, intensive educational program in jazz performance for a very limited number of exceptionally talented students who have just completed their freshman, sophomore, or junior years in high school. To date it has enrolled over 150 students between the ages of 14 and 18; some notables include Grace Kelly, Eldar Djangirov, Matt Marantz, Ben Van Gelder, and Marcus Gilmore. The Executive Director from 2001 to 2005 was J.B. Dyas. Steve Anderson, also a former Dean of the Conservatory of Music, was the Executive Director of the Institute from 2005 to 2011. Simon Rowe is the current Executive Director. Renowned bassist Christian McBride served as the first Artistic Director of the Brubeck Institute. In that role he set both the educational and artistic standards for the Institute, and especially for the Fellowship Program. He is still a frequent visitor to campus and works with the Brubeck Institute Jazz Quintet in private lessons, ensemble coaching, and advising about professional life as a jazz musician.For his commitment to and advancement of the music and ideas of Dave Brubeck through his tireless advocacy for jazz, inspired teaching, and exceptional and innovative performance, Christian McBride was named the recipient of the 2010 Brubeck Institute Award for Distinguished Achievement. In 2001 University of the Pacific alumni Dave and Iola Brubeck established the Brubeck Collection with their alma mater to preserve, promote, and pass on the rich legacy of jazz to future generations. The Brubeck Collection is a unique accumulation of materials presented by Dave & Iola representing all aspects of their lifes and careers. It also gathers materials from other available sources. 1. 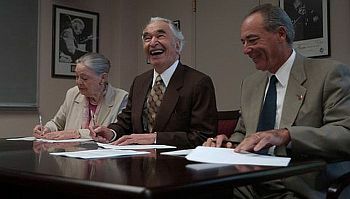 Photographs, media clippings, memorabilia, videos and musical recordings that document Dave Brubeck's bands and career. The Real Ambassadors was a musical which highlighted the absurdity of segregation and makes the case that artists such as Louis Armstrong are the best and "real" ambassadors to demonstrate a nation's ideals. It was recorded in 1961 and performed live only once. Despite the efforts of many, the play never made it to the stage. The collection includes letters, photographs, scripts, and audio recordings that document the creation of The Real Ambassadors. From March to May 1958, the Dave Brubeck Quartet embarked on an ambitious tour of Europe and Asia that was sponsored by the U.S. State Department. This tour was part of a "cultural ambassador" program in which the U.S. government sent prominent American musicians abroad to promote American arts and culture during the Cold War. 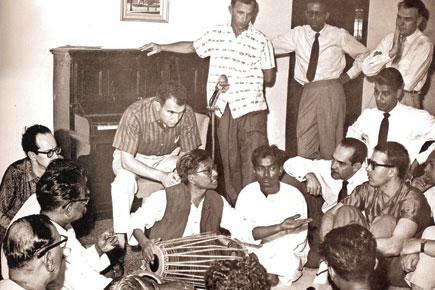 The Brubeck Quartet's tour itinerary documents performances in Poland, Turkey, India, Ceylon (now Sri Lanka), East Pakistan (now Bangladesh), West Pakistan (now Pakistan), Afghanistan, Iran, and Iraq. 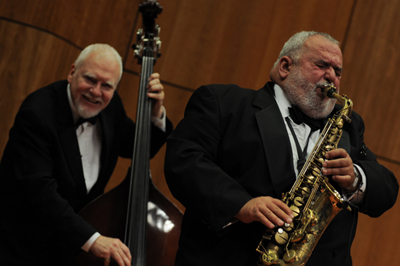 Throughout the tour, members of the Quartet interacted with local musicians, and these experiences inspired the album “Jazz Impressions of Eurasia”. 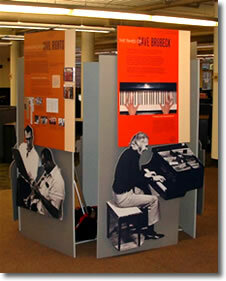 The digital collection consists of materials from the 1958 tour that are housed in the Brubeck Collection. It includes photographs, clippings, concert programs and audio recordings of Iola reading the travel journal written by their ten-year-old son Darius during the tour. 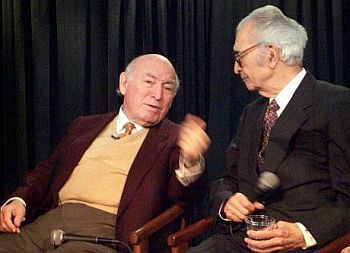 Dave and Iola Brubeck were interviewed for this oral history project on January 30 and 31, 2007. During the interviews, they discussed a broad range of topics from throughout their lives. Some of the stories cover well-known episodes in their career; others are related for the first time. The interviews were filmed at Ellington's Jazz Bar and Restaurant on Sanibel Island, Florida. Access to the entire interviews and their transcripts is available at the University of the Pacific Library's Special Collections department, and the Experience Music Project. • The Introduction starts the story of Dave Brubeck and includes a continuous audio loop of his music. • Pushing the Limits of Jazz shows the accomplishments of the Dave Brubeck Quartet and has an on-demand audio system that plays short clips of Brubeck explaining and demonstrating polytonality and polyrhythms. • Classical in the Key of Jazz describes Dave’s compositions and collaborations with Iola. • Ambassador of Civil Rights illustrates Dave's support of humanitarian causes. • Diplomacy During the Cold War explores how Dave used his music to open relations during the Cold War. Dave continued to tour extensively throughout the world until medical advice in 2007 forced him to call an end. His continued popularity with audiences meant that he had far more offers of bookings than he could ever accept. He toured Europe practically every year until 2005. His birthday celebrations initiated in December 1990 with the London SymphonyOrchestra for his 70th birthday continued for his 75th, 80th and 85th. 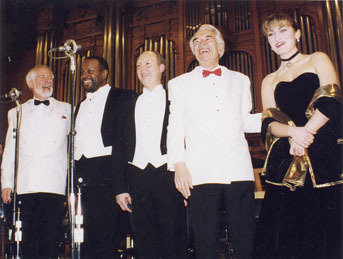 Darius, Chris, Danny and Matthew joined him on these occasions, the most notable being 2000, when the concert resulted in a release of “Dave Brubeck: Live With The LSO”. concert hall, the performers take in the applause. In 1997 Dave returned to Moscow, principally to perform his Roman Catholic mass, “To Hope! A Celebration”, with a Russian orchestra and choir. He was joined by regular quartet Bobby Militello, Randy Jones and Jack Six and his longtime manager, Russell Gloyd, as conductor. Dave had originally travelled to Russia in 1987. The 1997 tour resulted in a DVD release by Lance Entertainment, “Brubeck Returns To Moscow”. The DVD included rehearsal footage and conversations with many of the participants. It also showed Dave performing solo piano during a seminar, including his stirring tribute to the late Gerry Mulligan, "Goodbye Old Friend”. Dave continued to play jazz festivals primarily during the summer season in the U.S., most notably Monterey and Newport, which he remained loyal to throughout his career. "Dave Brubeck transcended the jazz world—even though he's an icon in the jazz world—but he's really one of those artists who crossed genres. He was a part of American culture," said Tim Jackson, artistic director of the Monterey Jazz Festival, on Dave’s passing. “It’s a lot more than just a wonderful pianist has passed on. He's a true American legend." The Dave Brubeck Quartet played for the Monterey City Council in 1957 "to kind of woo" it to let the festival take place, said Jackson. The Monterey Jazz Festival debuted the next year, in 1958. From that time on, Dave was a fixture in Monterey, playing the festival 15 times in its 55 years. His last appearance was in 2009, when he celebrated the 50th anniversary of his seminal album, "Time Out," and was awarded an honorary doctor of music degree from the Berklee College of Music in Boston at the festival. commissioned piece " Cannery Row Suite"
"There are three artists that stand out in my mind as being the most predominant legacy artists with the Monterey Jazz Festival—Dave Brubeck, Dizzy Gillespie and John Lewis of the Modern Jazz Quartet, who was music director for many years. But nobody other than Dave has essentially spanned the whole history of the festival," Jackson said. 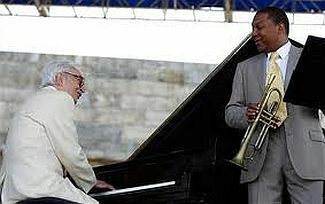 Jackson said he developed a close working relationship with Dave, especially on the "big projects," such as the 40th anniversary in 2002 of "The Real Ambassadors," a jazz musical Dave and Iola developed after touring on behalf of the U.S. State Department in the early 1960s; the festival's commissioned piece, "Cannery Row Suite," in 2006; and a tribute to his famed '50s and '60s quartets in 2007 and 2009, the latter of which included a guest appearance by guitarist Jim Hall. "He was an inspired musician. When he got an idea, he would call me on the phone and play it," Jackson said. "Those sorts of things are very special and it showed the kind of person Dave was. He had a wonderful humanity about him, a great sense of humor, and he was interested in life and interested in people." Dave Brubeck once said it wouldn’t seem like summer without Newport. Dave told the AP in an interview in 2004, upon the 50th anniversary of the festival that he loved playing at Newport’s Fort Adams, which looks out onto Newport Harbor and Narragansett Bay. “There’s no way anything can go wrong there,’’ he said. "You have the people on the grass in front of the bandstand and then further out there are people floating around in their boats in the bay, and that’s very specia.". Founded in 1954 by George Wein, the Newport Jazz Festival was the first annual jazz festival in America and played host to numerous legendary performances by some of the world's leading established and emerging artists. Referred to as the grandfather of all jazz festivals, the event draws thousands of people from all over the world to Newport, Rhode Island. Despite health problems, Dave had continued to play until mid-2011. In November 2010, just a month after undergoing heart surgery and receiving a pacemaker, he performed at the Blue Note in Manhattan. In the new millennium, Dave had two major documentaries made of his life and career. In His Own Sweet Way was produced by Clint Eastwood and directed by Bruce Ricker. Its premier broadcast was on 6 December 2010 to commemorate Dave’s 90th birthday. The documentary takes its name from one of Dave’s most famous tunes, "In Your Own Sweet Way." It tells Dave’s personal story, including his early musical training; studies with Darius Milhaud, the Dave Brubeck Quartet featuring Paul Desmond and the musical revolution caused by his introduction of new time signatures in jazz, such as in the jazz standard "Take Five." The film includes archival footage along with contemporary clips of Dave , his legendary quartet, two interviews with Walter Cronkite, and a special event with his sons performing in Washington as their father is recognized as a Kennedy Center Honoree in 2009. Other notable fans and musicians appear to discuss Dave’s influence and talent, such as George Lucas, Sting, Ray Charles, Yo-Yo Ma, and David Benoit. 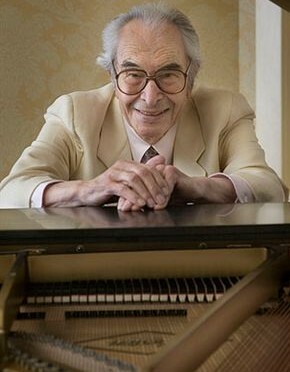 "Our much loved and revered father, Dave Brubeck died of cardiac arrest today, December 5, 2012, one day before his 92nd birthday. He died peacefully with family present. The news spread before we left Norwalk Hospital. Our family is deeply appreciative of the phone calls, messages of condolence and continuing tributes in the media and those received personally, certainly a reflection back to us of Dave’s powerful and positive impact on the world. He specialized in long relationships; married to our mother for 70 years, had few changes of personnel in his outstanding quartets or in professional management and many of his fans became personal friends he knew for decades. We thank you all for your appreciation of him and the respect you have shown our family." Tributes from every major media outlet in the world followed some of which are detailed in the Media section of this website. “Dave's funeral on Wednesday the 12th of December (12/12/12) was attended by family and very close associates, for example, members of his last quartet. He had written instructions in 2004 detailing readings and music he wanted at his Catholic funeral service and Iola found the sacred eagle feather which the spiritual leader of the Suquamish people had given Dave when his composition "Earth is Our Mother" was performed in Seattle many years ago.He was told that when he reached the 'other side' he should wave it, so the Indians who were already there would know he was one of them! One of the most moving tributes was posted by Chris Brubeck and can be read here. 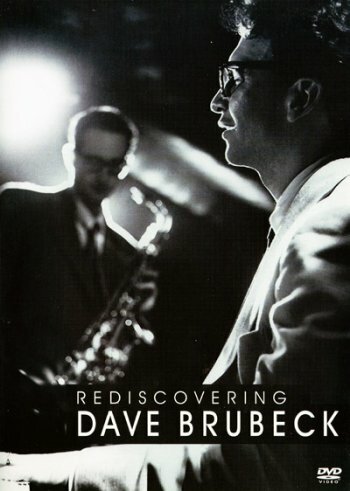 It captures, better than anything else written, everything that was great about Dave Brubeck, famed musician and absolute wonderful human being.